Bird’s eye view of the most spectacular of several sinkholes found near the Virgin River in Washington County, just north of the Arizona border. The hole is approximately 80 feet (24 m) wide and 60 feet (18 m) deep! The walls of the sinkholes are steep and unstable. Stay back from the edges of the sinkholes and keep children and pets at a safe distance. A sinkhole is a surface depression or hole created by the collapse of an underlying cave. Perhaps you’ve seen stories on the news about sinkholes in Florida swallowing cars and whole buildings, and thought that’s one type of geologic phenomenon Utahns don’t have to concern themselves with. 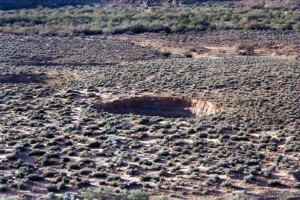 Sinkholes do, however, occur in Utah. Some have swallowed rivers: for example, Washington County’s Virgin River and La Verkin Creek. For several months in 1985 a sinkhole guzzled the entire Virgin River 2 miles (3 km) east of Pah Tempe Hot Springs. In 1996 La Verkin Creek disappeared into a sinkhole for nearly a week. 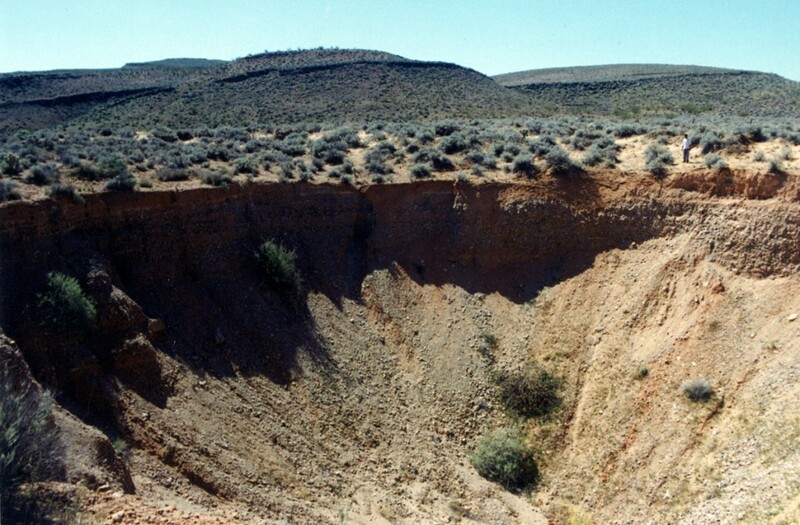 Both of these sinkholes have since been backfilled by a bulldozer and are no longer visible, but several other spectacularly large sinkholes can be seen adjacent to the Virgin River just north of the Arizona border in Big Round Valley, Washington County. 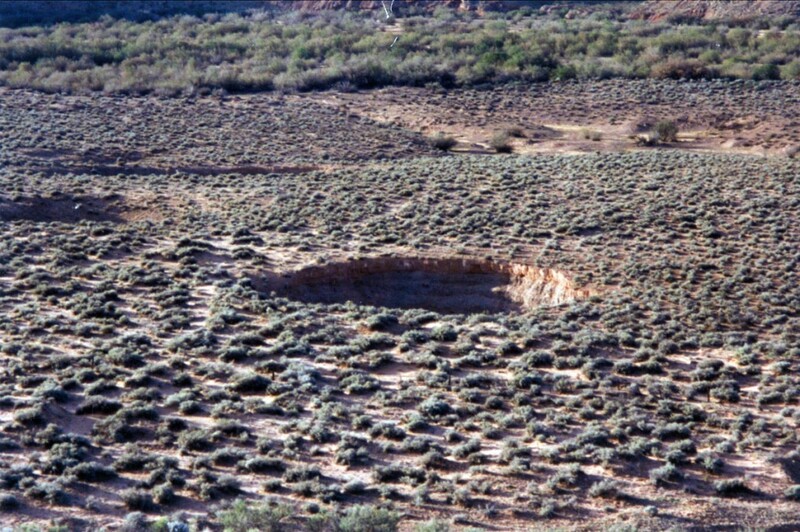 The most spectacular of the sinkholes in Big Round Valley is large enough to swallow several buildings. It occupies over 1/10 acre (0.05 ha), measuring approximately 80 feet (24 m) in diameter and 60 feet (18 m) deep! This and nearby sinkholes are found in stream-terrace sediments deposited by the Virgin River before it carved out its current channel. A veneer of wind-blown sand and silt covers the gravelly stream-terrace deposits. The origin of these collapse features and similar ones elsewhere in Utah is not always clear. They form when the roof of an underlying cave collapses, but what creates the underlying hole and how far below the surface is it? The 1985 Virgin River and 1996 La Verkin Creek sinkholes are both attributed to dissolution of underlying limestone bedrock, a process in which acidic ground water dissolves part of the limestone and carries it away in solution. In Big Round Valley, the underlying caves were probably created by a similar process when the mineral gypsum was dissolved and carried away by ground water. The Harrisburg Member of the Kaibab Formation underlies the sinkholes and is known for such gypsum “karst” features elsewhere in the area. Alternatively, or in conjunction with gypsum dissolution, part of an underlying limestone bed might have been dissolved and carried away in ground water. A third possible scenario involves a process called sediment piping, where ground water traveling along initially small cracks or holes carries away clay and silt-size particles. In this scenario, fine sediment is carried away in suspension by flowing ground water, and the small cracks can grow to large channels, or pipes. Piping features are usually much smaller than these sinkholes. At Big Round Valley, however, stream-terrace gravels solidified by calcareous cement may form a somewhat stable roof over the pipes, allowing the pipes to grow unusually large before finally causing collapse at the surface. For piping to occur, the removed silt and clay needs a sink or place to be deposited. Therefore, piping features usually end at the base of a river bank or other steep slope. However, the bed of the Virgin River is about 20 feet (6 meters) higher in elevation than the bottom of the biggest sinkhole in Big Round Valley. Thus the river channel cannot act as a sink and piping is not a very satisfying explanation. This brings us full circle to needing a bedrock cave created by limestone or gypsum bedrock. While Big Round Valley is in Utah, it is accessed from just south of the state’s border in Arizona. Travel south on I-15 and take the first exit south of the border, Exit 27 – Black Rock Road. Turn right (west) at the end of the off ramp. A short distance from the off ramp and immediately after crossing over a cattle guard turn right onto a dirt road leading north. Approximately 2.4 miles from the cattle guard is a fork in the road; take the right fork heading uphill. Approximately 3 miles beyond the cattle guard is a three-way fork. From this point, the sinkholes are approximately 400 yards to the right. If you see the river, but have trouble finding the sinkholes, climb the low ridge to the south and the sinkholes will become obvious from that vantage point. WARNING: THE DIRT ROAD IS ROUGH. A high-clearance vehicle is needed and four-wheel drive would be helpful. If you are uncomfortable with the condition of the road at any point, park and walk the rest of the way.